App is the 2010 word of the year | It-11 Audio / Tonegeek"
← Smartphones autocorrect jokes ! 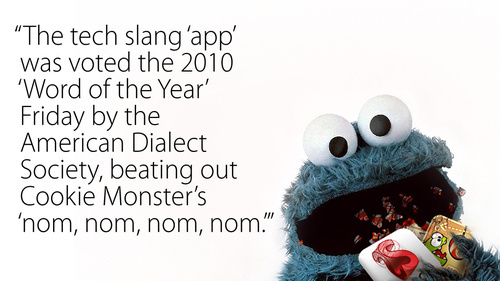 After a passionate debate, the American Dialect Society has decided that “app” would be “word or the year” for 2010, just preceding Cookie Monster’s “nom.” We all now are familiar with Appstore for iPhone, Appstore for Apple Mac, Android market (another appstore dedicated to this smartphone OS), and marketplace apps for Windows phone. This entry was posted in What's up, doc ? and tagged app, apps, appstore app store. Bookmark the permalink.